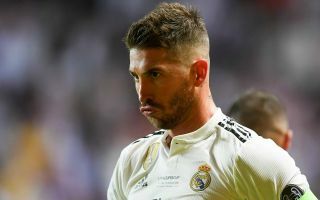 Although he remains at the top of his game, Sergio Ramos will eventually need to be replaced by Real Madrid and it promises to be an extremely difficult task. The Spaniard has made 575 appearances for the club since joining them in 2005, winning four La Liga titles as well as four Champions League trophies in a glittering career at the Bernabeu. However, there is no escaping the fact that he turns 33 next year, and although he has shown no signs of decline yet, it will become an increasing concern moving forward that there will be a major void to fill in the heart of the Real Madrid defence. According to Don Balon, the reigning European champions have set their sights on a long-term successor in the form of Benjamin Pavard, with the Frenchman said to have a €35m release clause in his contract at Stuttgart. The 22-year-old has enjoyed quite the rise to the top over the last few years, going from the Lille B team to a first-team regular in the Bundesliga while playing a prominent role in France’s triumph at the World Cup this past summer. In turn, he is gradually becoming accomplished for both club and country, albeit a big move away from Stuttgart is surely a matter of time if he continues to impress and remains consistent. It’s not the first time that Real Madrid have been paired with a swoop, as noted by The Sun, and so it remains to be seen if they push forward with their plans to take Pavard to the Bernabeu. In fairness, it’s a sensible strategy to look at the long-term picture as they arguably haven’t handled Cristiano Ronaldo’s exit particularly well given their troubles in front of goal so far this season. Further, signing Pavard in the near future to perhaps play alongside Ramos could be ideal for him to settle in too.